Overview: Santa Marta's El Hostal de Jackie is your best bet if you want to be in the heart of the historic center. This is not a party hostel, but it's your best option in Santa Marta if you're looking for a good quality hostel, chilled out ambiance, reasonable prices, and all the important hostel perks, like a free breakfast, kitchen, tour planning, rooftop terrace, and TV lounge, not to mention its delightful pool on the back patio. It's a great base for exploring Santa Marta and the surrounding attractions: Taganga, Minca, the new La Guajira tourism hotspot of Palomino, the looming Sierra Nevada, and, of course, the jewel of Santa Marta: the lush tropical Caribbean paradise of Parque Tayrona. The hostel is decorate with brightly-colored murals throughout, painted by a talented young Argentine artist. Vines, foliage, and many hanging-plants create a pleasant ambiance of tropical greenery. Neighborhood: El Hostal de Jackie is on the southern end of the centro, and just steps from the beach and the marina. It's a convenient location, very safe and secure, and you are close to all of the amenities you could possibly want. It's located on quiet residential Calle 21, just a block and a half southeast of the iconic Parque de los Novios, where you'll find some of the best dining, nightlife, and hangout spots in the city. How to Get There: If you're arriving at Santa Marta's Simon Bolivar International Airport, it's about a 45 minute ride in a taxi (perhaps 30 minutes with no traffic) and it should cost around $30.000. If you are arriving at Santa Marta's bus terminal, it should be just $5.000 or $6.000 in a taxi. Just give the driver the address! Management/Staff: Jackie founded this hostal almost two years ago, and it's developed a great reputation for its laid-back and relaxing atomsphere, thanks in no small part to its wonderful staff. All of the staff have some knowledge of English, including some with advanced knowledge. They are happy to help you out, and want to make you feel at home. Rooms: El Hostal de Jackie offers guests four private rooms (2 with AC and shared bathroom, 2 with private bathroom and fan), and a selction of 9 dormitories at various price points. Prices increase a bit during high season (December/January, Semana Santa, June/July/August), as is typical on the Caribbean Coast, including Cartagena and Barranquilla. During the high season, make sure to call or email ahead of time to make your reservation. Shared Rooms: There is one large dorm with 12 beds, a medium-sized dorm with 6 beds, and 5 dorms with 4 beds. Private Rooms: For couples and pairs, there are 2 smaller rooms with 2 beds. In addition to the location and the great staff, the two shining gems of this hostel are undoubtedly the delightful pool which you'll find out back, and the third-floor terrace with bar and billar table. The pool is available for all guests, and is located in a tranquil terra-cotta tile-lined patio surrounded by charming brick walls with creeping vines. The pool's best feature, however, is that there are two bar-style chairs underwater on the shallow end: you can grab a book and drink and laze away the afternoon soaking up Santa Marta's famed rays, half-submerged in water. There are also wonderfully comfortable rainbow-colored deck chairs. Up on the sprawling terrace you'll find great views of the surrounding area: look to the east and you'll see the foothills of the impressive Sierra Nevada, which includes Colombia's highest mountain, Pico Colon. To the northeast you'll see the Arabic-inspired steeples of the Iglesia de la Catedral, while looking to the northwest you'll catch glimpses of Santa Marta's bustling port. While many hostels offer a pool table, this is the first I've seen that has a billar table: billar is a sport similar to pool, but there are no pockets and only three balls. Billar has a rich history in Colombia; in fact, it was a favorite sport of Colombian heroes Simon Bolivar and Francisco de Paula Santander. Breakfast: Included in the price for all guests, and served daily from 7am to 9am: It's a typically Colombian breakfast, including eggs (scrambled or fried), toast with butter and jam, fruit, coffee, tea, and juice. Kitchen: There is a great kitchen for guest use, that is open from 7am to 11pm. The first floor kitchen area is wonderful: it includes a picnic table, refrigerator, microwave, coffee maker, water-purifier, and a wide variety of dishes and utensils. Restaurant: The famous Parque de los Novios is just minutes away, and is packed with wonderful restaurants; many of which are open late! Bar: There is a bar serving beer and cocktails. Laundry: There's also a laundry service that costs $5.500 per kilo, just drop off your laundry in the morning, and it will be ready by the end of the day. TV Lounge: There is a nice television area on the second floor with cable TV where you can also watch movies. Computers: There is one computer available for guest use. Conclusion: So whether you're a solo tourist, couple, tour group, or backpacker looking for something other than a raging party hostel, El Hostal de Jackie is your best bet. It's got a friendly staff, very knowledgeable about planning your expeditions, and most of the staff has basic to intermediate English skills. They are sure to make you feel right at home in your new "home away from home" in Santa Marta. 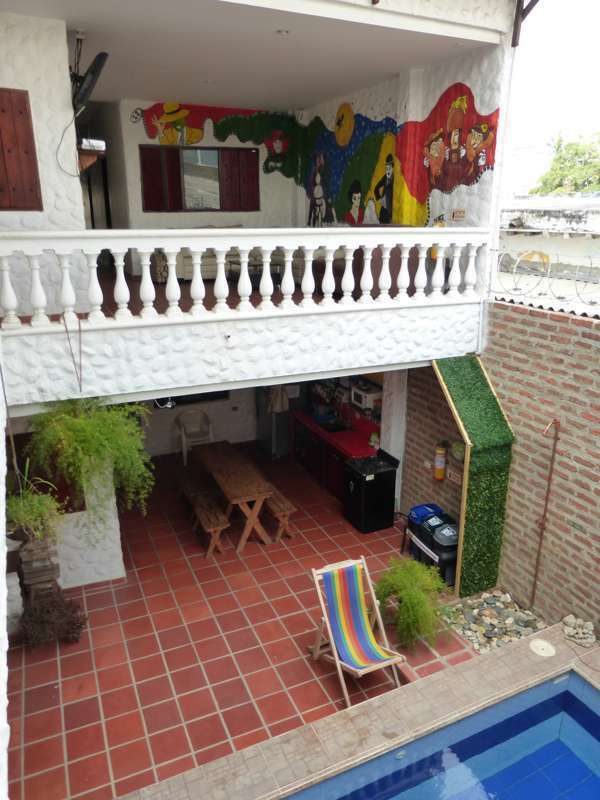 It's a fanastic spot, and Colombia Backpacking strongly recommends El Hostal de Jackie!